Learn how to write website copy to rank in the search engines, get found by potential customers and earn more SEO traffic to your website. Ever written a web page or blog post and it gets no traffic or visitors ? I’m not a writer by trade, failed English twice in high school but have an honours degree in marketing from university, my grammar and spelling is still poor. Writing for the web and your potential customers is completely different than writing for other mediums. So this is my guide to writing web copy for the search engines and user intent. Before I write a word, I always start with keyword research. I want to give myself the best chance to get traffic to my website. If you don’t use a premium keyword research tool your chance is success will plummet. Just take out a trial with Ahrefs or Semrush (or use Ubersuggest for keyword research) and model the 3 examples in this guide. 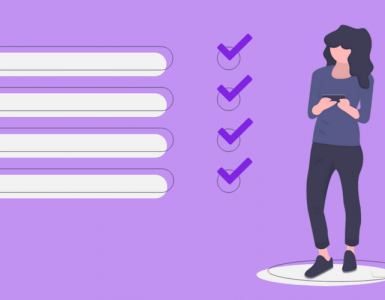 What is “intent based keyword research” ? 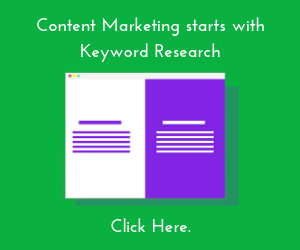 Keyword research is the process of discovering what people type into Google. Intent simply means you know what someone wants without asking them. 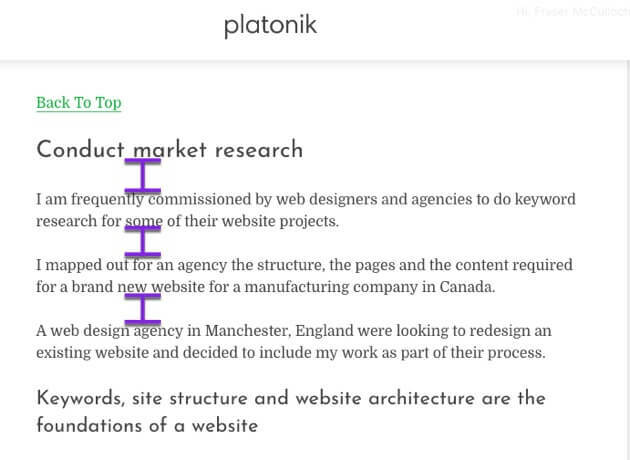 So combining intent and keyword research is to find out what people Google then knowing what they want. Let me demonstrate with 3 examples. This is a recruitment company that has a page for new accountants. The page gets 285 visits from Google a month. 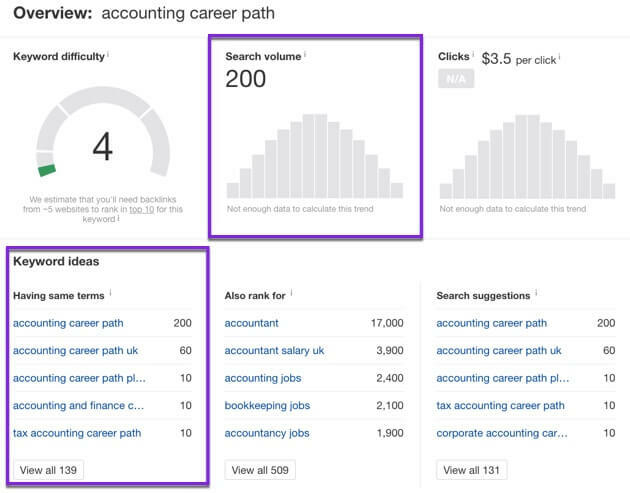 The seed keyword, accounting career path, has only 200 searches a month. 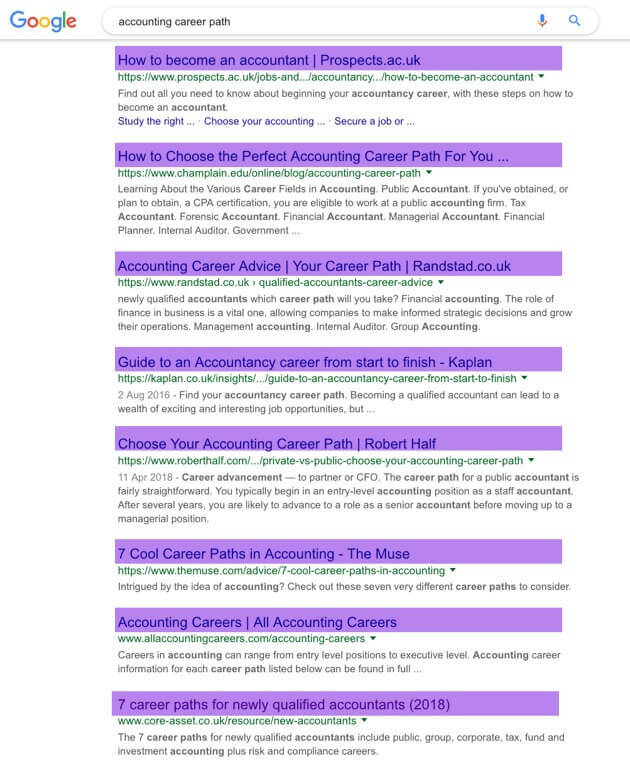 However there are 139 keywords having the same term as “accounting career path”. People type different queries but really they are all looking the same answers. At least 200 searches per month. At least 100 same term keywords. So when people are searching “accounting career path”, they’re actually looking for reassurance they have a future in this line of work. My favourite grey trousers are wearing out so I need a new pair. Google “grey jeans” and look at the search results. 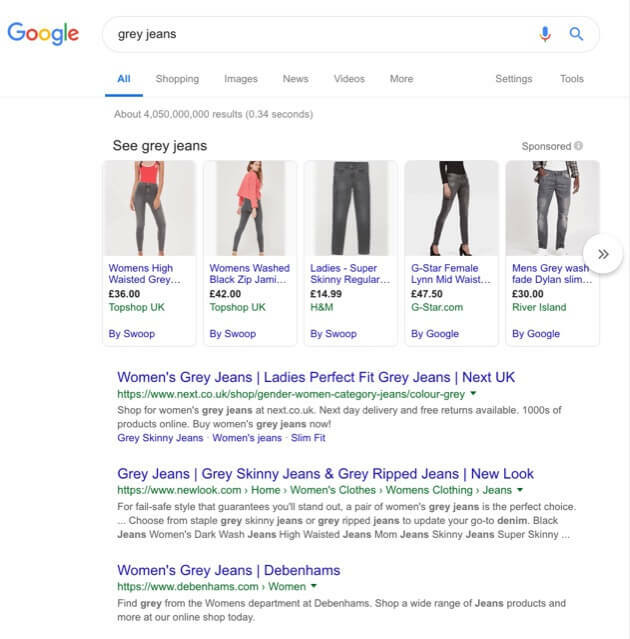 Notice how Google show men and ladies jeans – Google unsure what you want, so show both. There are 2900 searches a month for the query, low difficulty and 2593 other search terms that include grey jeans. Now Google “mens grey jeans”. Google show you images and pages containing mens jeans. There’s half as many searches for “mens grey jeans” as “grey jeans”. And 330 other search terms that include mens grey jeans. Now let’s Google “what to wear with grey jeans”. 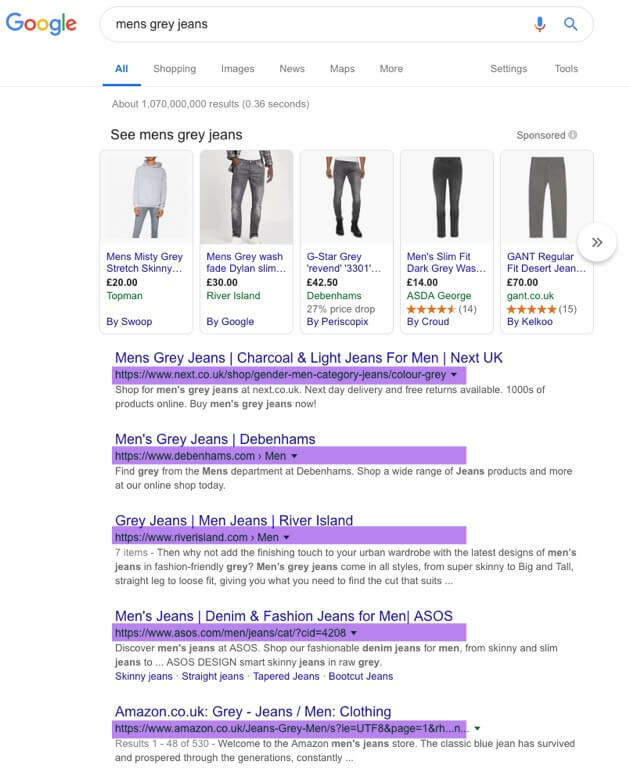 The results are very different from “grey jeans” as the search intent is completely different. This type of search is made by someone who may or may not have grey jeans. They are probably looking to combine grey jeans with other garments such as shoes and jackets. There are 450 searches a month for that search query. And 110 other search queries that contain “what to wear with grey jeans”. 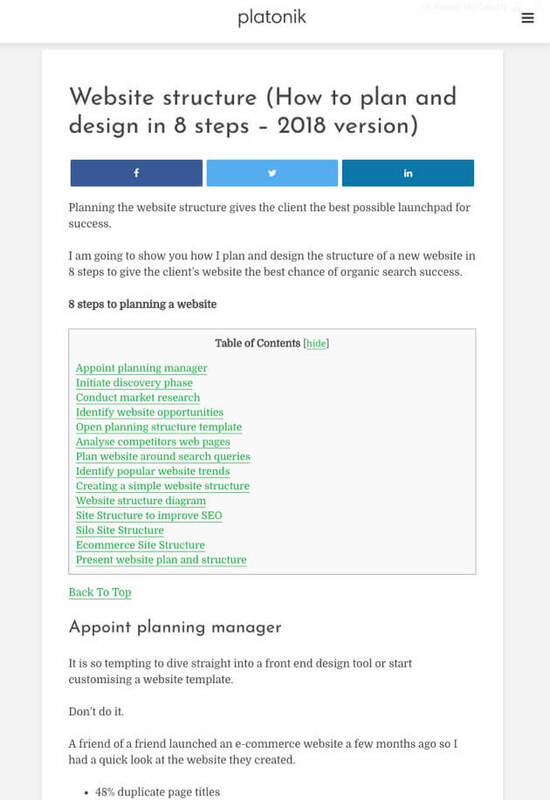 I wrote a guide to planning and structuring a website a couple of years ago. The page provides me with a steady stream of organic traffic and subscribers. In the past year I’ve had 286 people subscribe to this guide; that’s an average of 7% of people who visit the page subscribing. 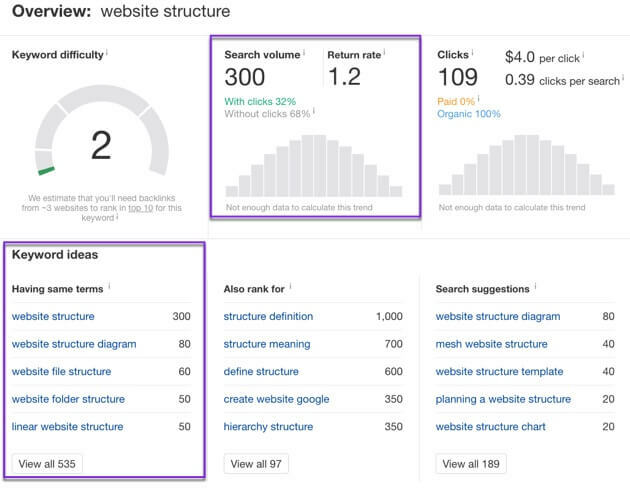 The keyword with the top search volume is “website structure” only has 300 searches a month. Notice, in the above screenshot, that there’s 535 other keywords people search that include “website structure”. I have the benefit of hindsight, using Google Analytics, and can see the search queries that lead people to my website. Use a premium keyword research tools such as Ahrefs or Semrush. Enter your seed keyword into their keyword explorer tool and use intent based keyword modifiers such as “how” “for” “with” “and”. 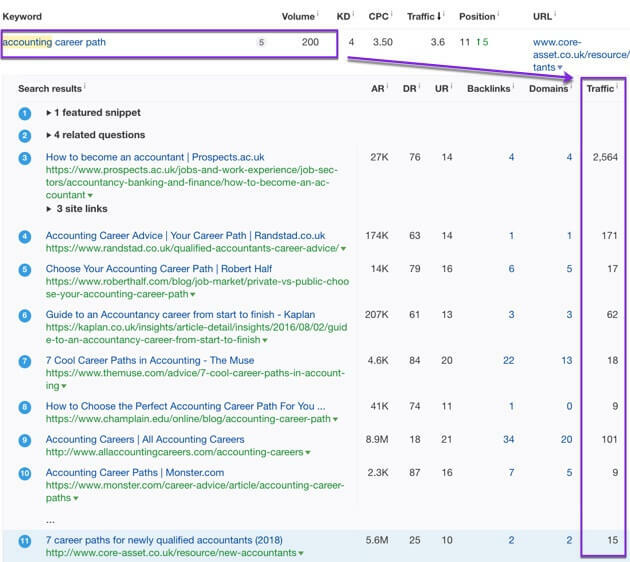 As a minimum requirement, the search volume of the main keyword should be 200, low keyword difficulty and at least 100 same as keyword terms. Google has become really good at delivering the best results based on what you search for or the question you have. 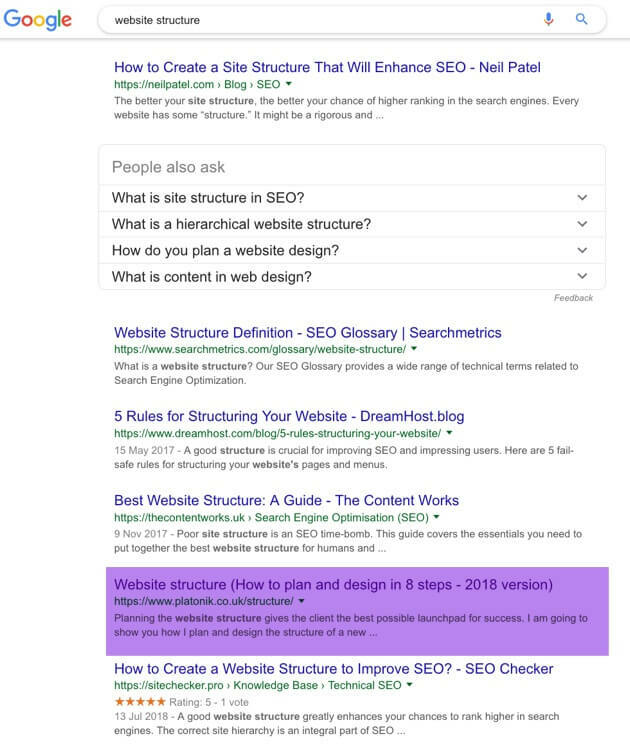 The second step to take before writing any web copy is to check the SERPS (the top 10 research results) and then read the copy of these top pages. You can click SERPS next to a keyword in Ahrefs and see the page title of the top results; along with traffic estimates to each page. Or you can Google the query and see the top results. For this query, the results do tend to vary – guide, career, become, career path. 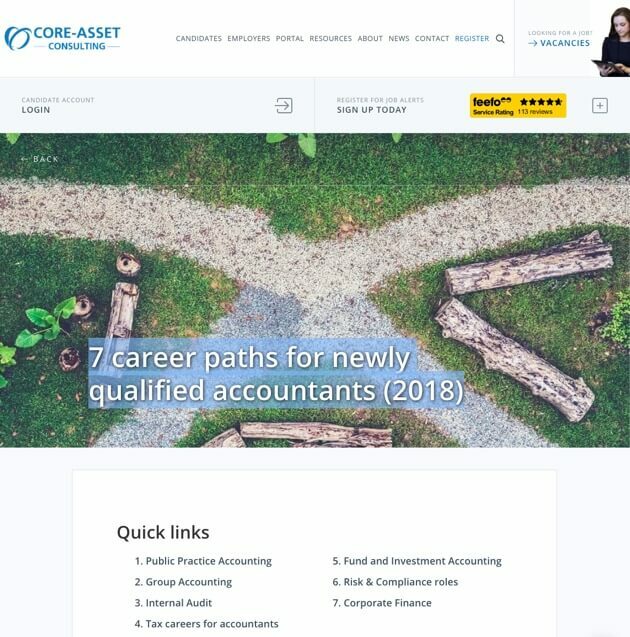 Visit my client’s accountant career path page and read their website copy. They list different roles, salaries, benefits of each career and the type of people suited to different roles. This is useful and valuable advice for someone starting or pursuing this career. 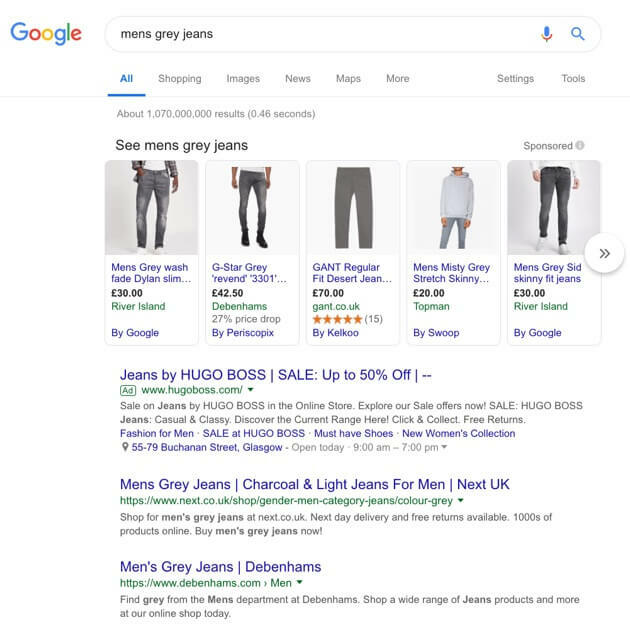 If you Google mens grey jeans and look at the top results you can see Google show product images. And you can see from the breadcrumb urls that Google is showing a catalogue list of jeans. So if you sell mens jeans, your best chance of ranking for grey jeans is having a shop catalogue of grey jeans. 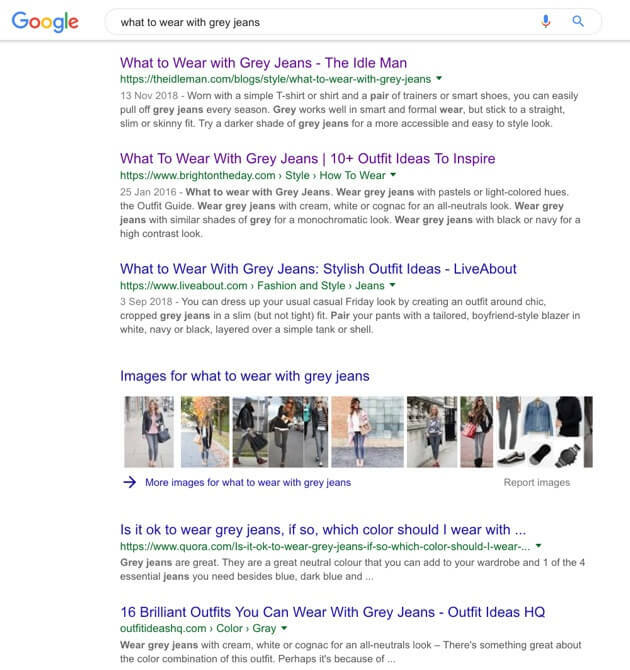 If during your intent based keyword research you decided to write “what to wear with grey jeans” you’d need to solve the user with different content. You’d need to decide if you are writing for men or women; as the search results vary. 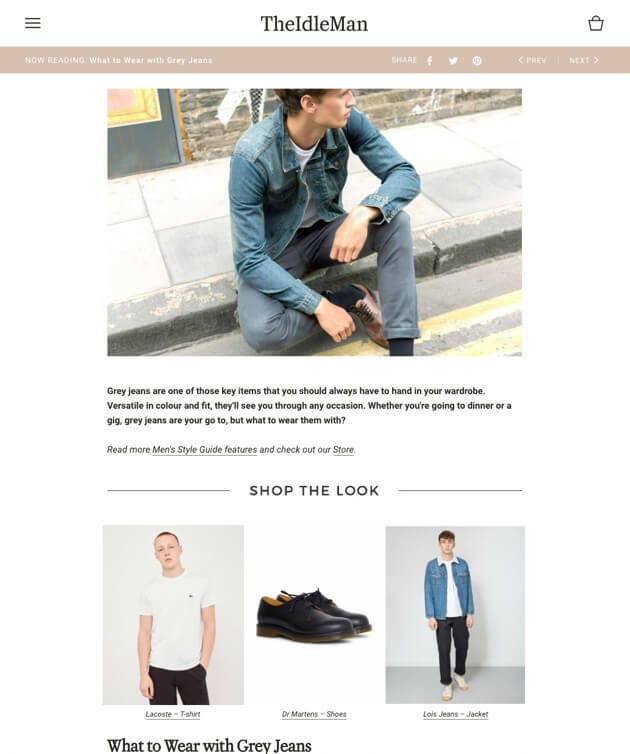 For this type of web copy, you probably don’t need to be much of a writer but more of a fashion merchandiser or stylist. A person who can mix and match products, take or source images and summarise each matching look. 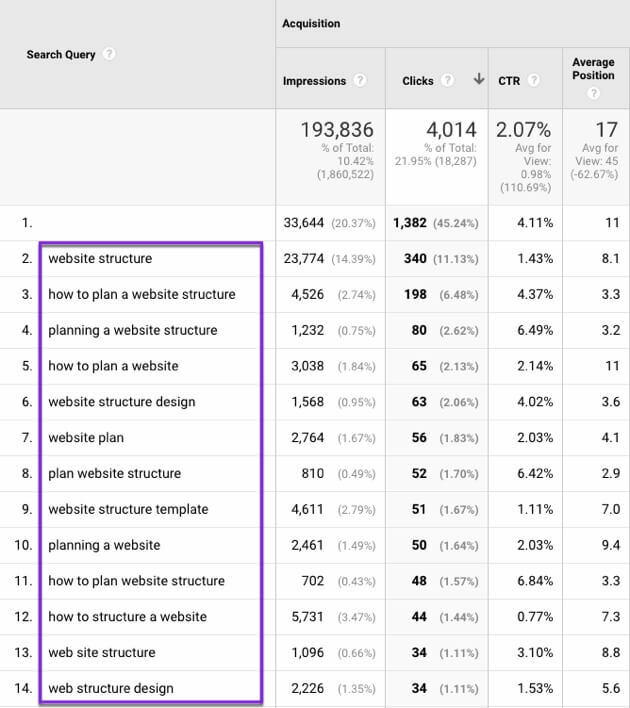 Now look at the top 10 results for website structure. I have the weakest website in the top 10 and I’m outranking a bunch of very authoritative sites. The user wants to plan the structure of a website; I give them very detailed steps. I just checked the top Google result; yes their content is good; practical but not as detailed as mine. They outrank me because they have more links to their page (and they are a more authoritative site). Look at the page title under SERPS in Ahrefs or go and look at the page title of the top results in Google. This will provide a basic intent understanding and the content Google rank. Read the top pages; sometimes the pages are out of date or you firmly believe you can write better copy or an answer to the search query. So that takes us nicely onto web content formats. Think of a content format as a template. Most web designers and developers are familiar with home page, service page, catalog and product page templates. They are repeatable, proven layouts that provide the user with the content they need to take the next action. And web copy and pages are no different. They simply differ depending on the search intent. This page is a guide and the content format is a list post. Using h2 subheadings each job or career is listed with a number. If you intended to target ‘grey jeans” it’s likely you will list the grey jeans you sell in a shop category layout. As such you won’t write much web copy; maybe a few paragraphs as most of the page copy will be automatically rendered from your product descriptions and titles. But if your intent based research reveals that you would write “what to wear with grey jeans” then you’ll need a different content format. The content format in this example is fairly basic; but it works. This is a website built with Shopify; and Shopify page and blog layouts are very basic. But there are apps you can use to drop in products or you can manually code column layouts. Since this article is written as a how to guide, the content format is a relatively simple list post. Research from Moz has shown that a list post content form is the most successful format in earning shares, links and traffic. 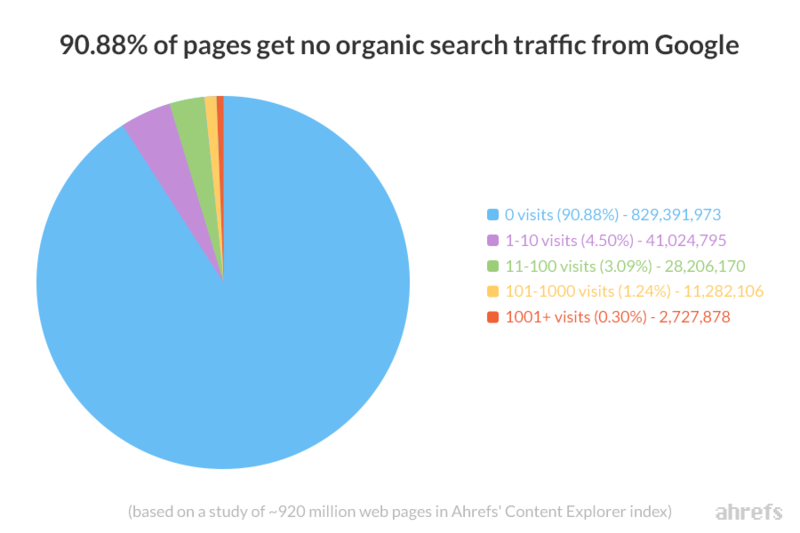 When you combine that research with Ahrefs data that over 91% of web pages see no traffic maybe writing content in a list format is the path to organic success. 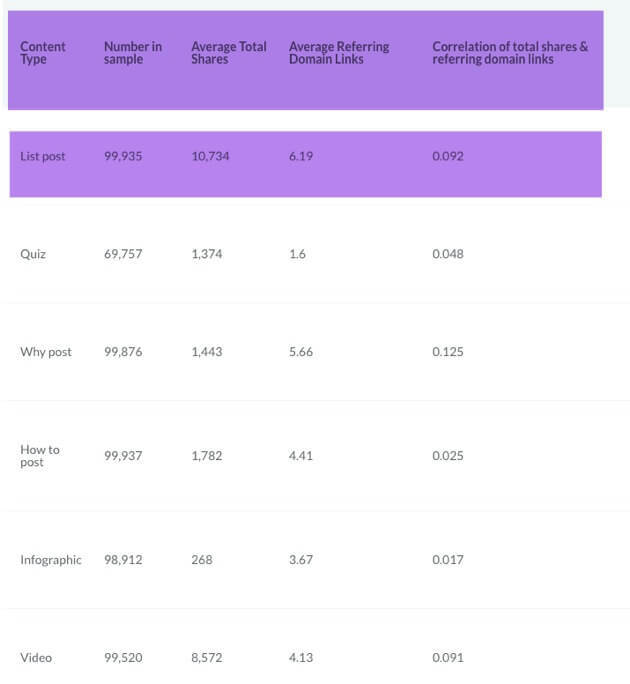 The most popular content format is a list post. Depending upon your content management system, there are using different apps or plugins for creating different content layouts. It will be interesting to see how content formats evolve with the introduction of Gutenberg in WordPress. With your research and content format done based on user intent, now you need to write a compelling headline. So I went back and did my research again; did more keyword research, looked at the SERPS and completely revamped the website copy. Before the page was just a list of technical page fixes and tips. The page still ranks and gets traffic from Google; but not enough. Now the page is a guide on “How to write website copy for SEO, the search engines and user intent“. I know my audience and target market a lot more than before. I know many web professionals and business owners don’t do much keyword research before they commission a new website or get a new website designed. 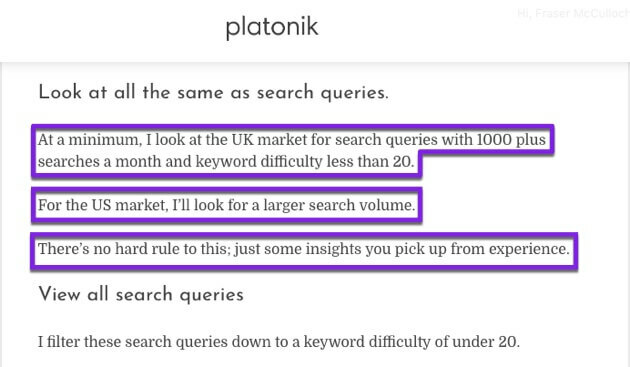 And yet providing keyword research services for clients is not simply not enough. I have to show and tell them what to write. I will write the client a compelling page title and headline based around the research intent and give them a content format and outline. Then all they need to do is fill in the blanks with their copy. I don’t worry so much about writing the meta description as it tends to be an extension of the page title or the first sentence of the web page copy. Here’s the page title for the client’s page in the below screenshot. It’s not very compelling but it matches what people are searching for and as we say in the UK; it does exactly what it says on the tin. For the jeans example page title below. Again compelling copy at all; simply descriptive text. 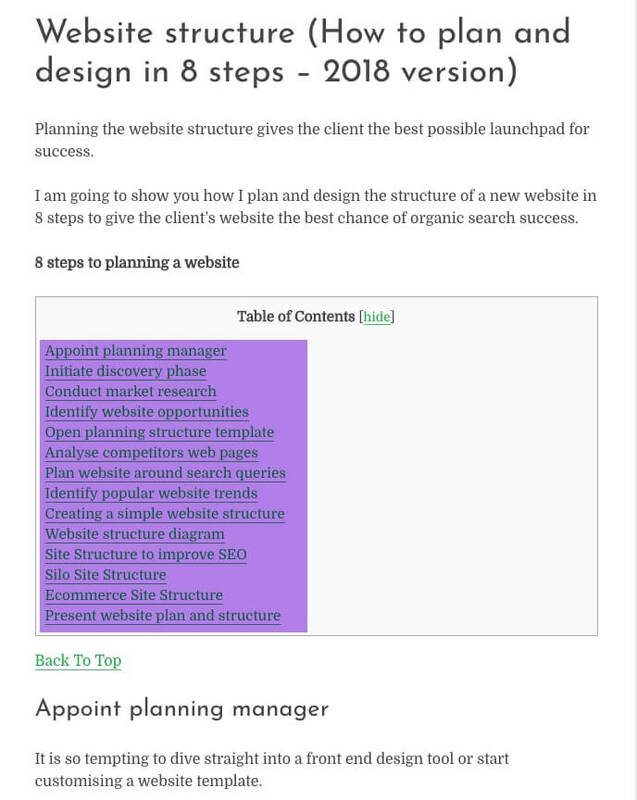 In my page example, yet again not very compelling but the title starts with the seed keyword and offers what the user is intends to get; how to plan in 8 steps. If you have the Yoast plugin for WordPress, you can preview the title and description. If you don’t have WordPress preview the page titles with SEO Minion. 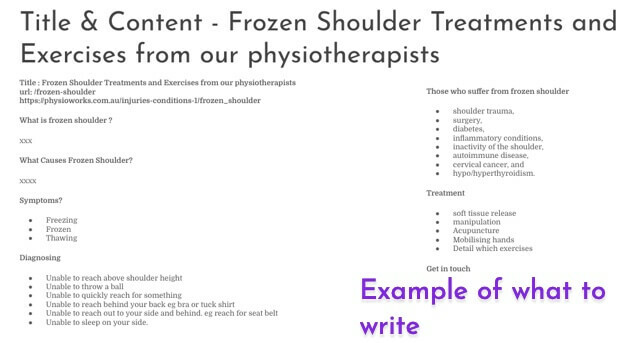 Or re-write the page title using a tool such as the ShareThrough headline analyser. 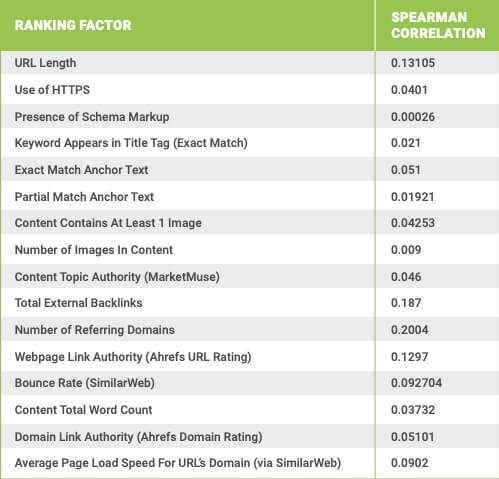 Brian Dean’s research with Ahrefs a couple of years ago highlighted that the URL of a page is one of the most important on page ranking factors. The URL is a signal to Google about the page. This page url is /website-copy/ – so it gives Google a little clue about the page content. Look at the top 10 results for website copy and you’ll see that exact phrase is contained in every result. Use a short url, preferably your main, seed keyword found in your research as the page url. Do not under any circumstances using the year in your URL; keep the year for your page title and description. Once you’ve written your compelling headline and page title, now you need an introduction to your page. The first sentence of your web copy should include your main keyword or search query. Here’s the copy in the first sentence of my page. This copy helps to reinforce to users what they will get from your reading my page. You can utilise the first sentence as your meta description; but please ensure you include your seed keyword and secondary keywords in your sentence and meta description. Start the draft outline of your page in Google Docs or Word. Write your title or headline with an H1 header. Underneath the heading, write down your subsections. Write out these elements using an H2 header. Think of your subheadings as chapters in a book or steps in a guide. If you’re creating a how to guide; write the sub heading of the first step, then the second step and so on. Once you have a list of subheadings using the h2 header, then flesh out the sentences and copy underneath each point. If needs be, use a H3 header to break down each of that section if it becomes too lengthy and monotonous to read and skim through..
Then you can begin to write and add in your copy, phrases, concepts, research underneath each sub heading. I recommend using Google Docs to draft the copy of my page outline because it is fairly easy to copy and paste the finished page into most content management systems. Many SEO experts suggest using the related searches at the bottom of the search results as the related keywords you should include on your page. I have been using an LSI keyword tool called SEO Hero that will show you the most frequent and occurring phrases included on the top 100 results for a search query. For this article about website copy, here are the most frequency phrases that are needed. 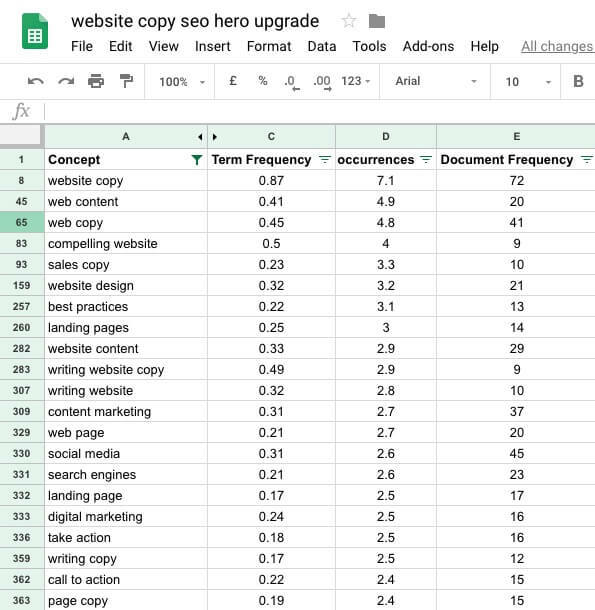 In my SEO Training membership I have a detailed training course that outlines how to write web copy using LSI keywords. Join my SEO Training membership and I’ll teach you how to research, write and rank better. Here are some copywriting tips that I’ve picked up and used over the years. Writing technical, marketing and instructional copy can be really boring for end users. So, in my head, I like to think that I am writing a story to tell and sell to readers. I have a beginning, middle and end. I have a character; that’s either myself or a client or a case study example that I feature in each article. Follow Steven Pressfield, he’s the best copywriting teacher I know. Keyword research and checking the SERPS will provide you with half the solution to write web copy. The other part of the solution is to write your website copy thinking about helping an actual existing customer. I’m writing today with one person in mind; a previously paying customer who needs website copy help. You can use the Ahrefs question filter in keyword explorer to find questions relating to your seed keyword. Or you can use Answer The Public for customer questions. Go into a relevant Reddit forum and look at the top topics and you’ll find questions people have. 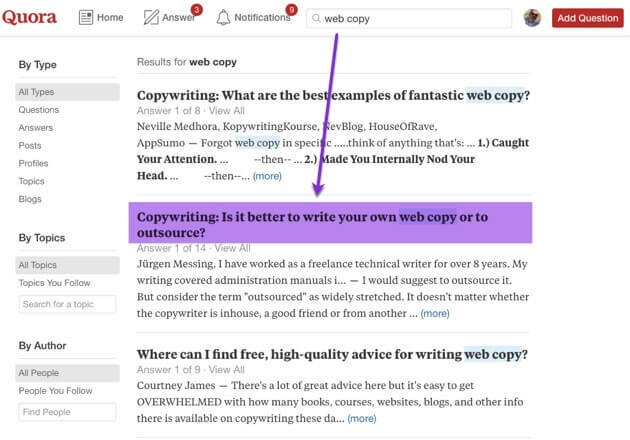 Or use type your seed keyword into the Quora search box and look at the questions. Ps: you should write your own copy if you have the time and the skills. If you have the budget I would recommend outsourcing your web copy; with a well research brief I outsourced 16 articles to a copywriter and was delivered the results in 5 days. When you consider the users interests you also have to consider the ease of reading your copy. The following are technical web copy elements that I’ve found enhance the user experience of reading my page content. When I redeveloped this website the font size of my paragraph or body font size increased from 13 points to 18 points. I wanted to made is easier for users to read my copy. My website stylesheet and WordPress theme has the ability to define different font sizes for the body, H1 to H6 headings. I have a 1rem or 16 point space between each line and a 1rem, 16 point space between each paragraph. The paragraph space is almost the same space as a new line. Instead of cramming 3 sentences into a paragraph, have 3 sentences and 3 paragraphs. To communicate a new paragraph use a header such as an h3, h4 or h5. When your sentences extend beyond 14 words it becomes much harder to read on mobile devices. Sentences that take up 3 lines become difficult to read as you scroll through a page. Your sentences should not be any longer than 20 words. A sentence of 14 to 20 words should be contained in one paragraph. After you finish one sentence start a new paragraph. Here’s an example of a paragraph with more than one sentences. Here’s an example of one sentence per paragraph. Remember, we are writing copy to be read on mobile devices, tablets and computers by people who skim pages to find answers. We’re not writing an essay for a college professor or to please a journalist or newspaper editor. Adding images should support your copy or story you telling. Images can also catch the user’s eye, support your copy or become a focal point on a page. I use a lot of screenshots to support what I write on a page. It’s tempting to take a full page screenshot but these are difficult to read on mobile devices. Purchase a copy of Snagit - this will enable you to take precise areas of a screen; then resize the capture image to the width of your page. This will make the content of the image easier to read and faster to load on pages. I am using bullet points and lists in three different ways on my website. As chapter or section links to direct users to each section on the page. When I get lazy and don’t want to write long sentences. To keep the reader’s attention and prevent skimming the content. Ask your web developer to adjust your style sheet and include the above formatting. Some web pages are very simple and do not require many words; sometimes a few visuals and bullet points are what the search results and users require. However, research by Brian Dean has shown that pages that rank in the top 10 search results have 1920 words on average. My average page copy is around 3400 words. I have an 18,000 word blog post that ranks for over 1,000 search queries and delivers over 1,000 organic visits per month. The original version of this page was 1700 words; since updating and improving the page the word count is around 3900. Page length is an indicator of quality but don’t obsess over it. Check your copy count in Google Docs with Tools - Word Count or use SEO Minion to check the word count of an existing web page. When you analysis user studies of people visiting web pages you will see that they quickly scan up and down the page. Once they find an element of interest, a phrase, heading, image or other element they will stop then read the page in full. Using tables of content and jump to hyperlinks help the user navigate sections of the page and your copy. These links, similar to chapters in a Kindle book, allow users to quickly jump to a particular page section very quickly. Adding Jump To SEO links may also help you rank better in Google for related search terms you add to your updated page. I have written a full length guide about the benefits of Jump To SEO links. 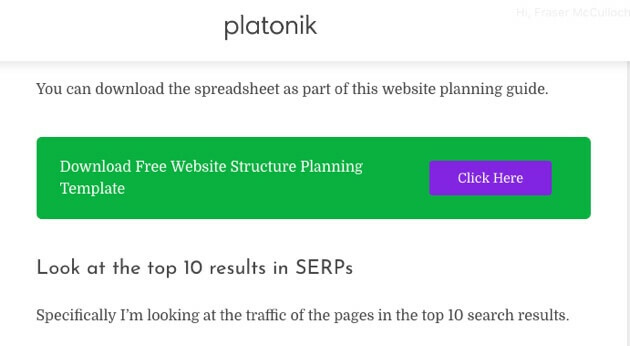 In addition to jump to links I have added back to the top of the page links throughout each blog post. The idea behind such links is to keep the user engaged on the page and use the page like a manual or reference guide. For WordPress websites there’s a plugin called Table of Content Plus that will automatically populate your page with headers. I have a purple and green box sprinkled between my page copy with a call to action, a first name, email form and download button. The copy in each call to action box closely matches the page title. I typically make an offer to users to download a PDF version of my page; since my pages are typically useful guides. I avoid generic call to action copy such as register for more tips or join my newsletter. 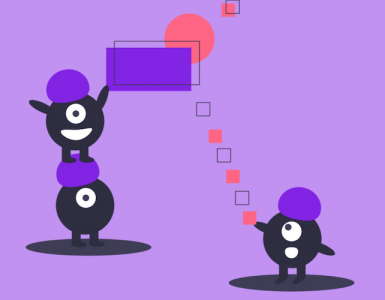 For WordPress users, purchase the Content Upgrades plugin to easily add call to actions on a page; for non WordPress users consider OptinMonster. And finally there is the Google TrustRank factor. TrustRank is an internal system developed by Google to help them figure out which pages to trust. Answer users’ questions and concerns. Have links from relevant, industry websites. You need to give people who visit your page sufficient time to read the majority of your page. If you follow most of the advice in this article you will have a fairly trusted and relevant web page to give you the best chance of ranking and SEO success. I hope 3 examples of writing copy for SEO was useful. 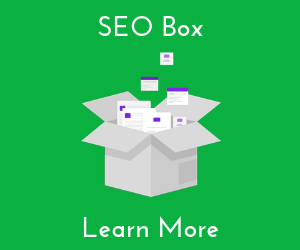 There are more content formats and keyword research strategies contained in my SEO membership programme; SEO Box. 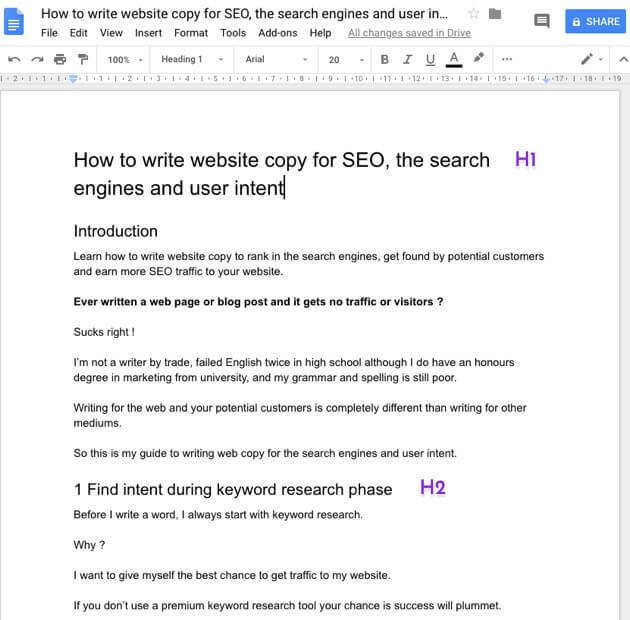 Enter your name and email to download my guide to writing copy for SEO.